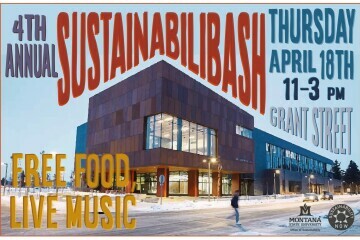 On Thursday, April 18th, Grant Street will be transformed from a busy campus street into a carnival-like celebration of sustainability and local bravado. Live music, free food, free raffle prizes, artwork, activities, and an assortment of campus and community organizations will set the mood for a lively event sure to inspire all attendees. This event is free and open to the public. This is MSU’s Fourth Annual Sustainabilibash, a catapalooza-style event designed to celebrate Earth Day by showing off the nonprofits, businesses, and student organizations that are making Bozeman a more sustainable community. Organizations in attendance will include the MSU Office of Sustainability, Bozeman Bike Kitchen, MSU’s Farm to Campus Program, GVLT, and many more. The event is organized by Sustainability Now (SNow), a student organization dedicated to making MSU a more sustainable campus and building support and awareness in the broader community. The event will run from 11am to 3pm and will take place on Grant street between 11th and 7th avenue. Be sure to mark this in your calendars for a fun-filled day of sustainability! For more information, please email snowmsu@gmail.com.